The 2010 Perseid meteor shower has been in full swing for at least the past 24 hours, but you still have a last chance to see a good display of meteors before dawn August 14. In addition, as night falls this evening, you can see Venus near the waxing crescent moon in the western twilight sky. 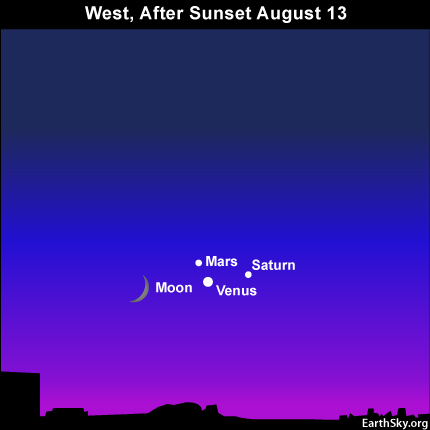 Today’s chart shows that lovely sky scene, which will set soon after darkness falls. You really have to be a night owl or an early bird to see the Perseid meteors at their best. The Perseids gain strength after midnight and typically rain down the most meteors in the dark hours before dawn. In a dark sky, at the peak, you can expect to see about 50 meteors per hour. The peak is past now, but you still should see a good number meteors if you are in a wide-open, dark-sky location. You need a dark sky to fully appreciate the Perseid meteors. Enjoy the comfort of a reclining chair and allow yourself at least an hour of viewing time. Your eyes take about 20 to 30 minutes to fully dark-adapt. What’s more, meteors often come in spurts and lulls. If you trace the paths of these Perseid meteors backward, they all seem to radiate from the constellation Perseus – hence the meteor shower’s name. However, you do not need to know Perseus to watch the show. These meteors will streak all across all parts of the heavens. We see the Perseids every August, because this is when our planet Earth crosses the orbital path of Comet Swift-Tuttle. Bits and pieces from this comet vaporize in the Earth’s upper atmosphere to give us the annual Perseid meteor shower. By the way, before the Perseids start flying tonight – during the evening hours – you might try checking out two very prominent star clusters, known as M6 and M7. Like the meteors, these two star clusters are best seen in a dark country sky. Bring along binoculars, to see the clusters at their best. Look southward to see the starlit trail of the summer Milky Way passing by the Teapot asterism and the J-shaped constellation Scorpius. 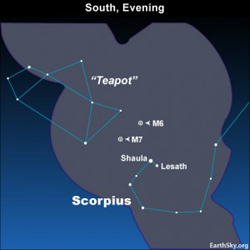 Refer to the two stars at the tip of the Scorpion’s Tail, Shaula and Lesath. If you will draw a line between Lesath and Shaula, this line nearly points to M7. M6 is just above M7 as you stand facing southward. These are actual clusters of stars in space, born together, bound by gravity. With Venus and the moon in the west after sunset tonight – more 2010 Perseid meteors before dawn tomorrow – and these star clusters to identify – tonight is a great night for astronomy! Let us know what you see. Site contents copyright © 2019 Recorder Online	except as noted. All rights reserved. | 88 queries in 2.058 seconds.